3d Arrows Over Dollar Bills Finance PowerPoint Templates And PowerPoint Themes 1012-Use this template containing 3D arrows over multiple Dollar Bills to highlight the key issues of your presentation. This Template Portrays the concept of Financial Growth. This template can be used to express the issues related to Finance growth and employment of United States of America. Your quicksilver ideas are the arrows in your quiver. They are logical accurate and to the point. Use our appropriate template to get them across to your target audience.-3d Arrows Over Dollar Bills Finance PowerPoint Templates And PowerPoint Themes 1012-This PowerPoint template can be used for presentations relating to-"Three 3d arrows over several, arrows, business, finance, money, success, signs" Feast your eyes on our 3d Arrows Over Dollar Bills Finance PowerPoint Templates And PowerPoint Themes 1012. Get drawn in by their colorful display. 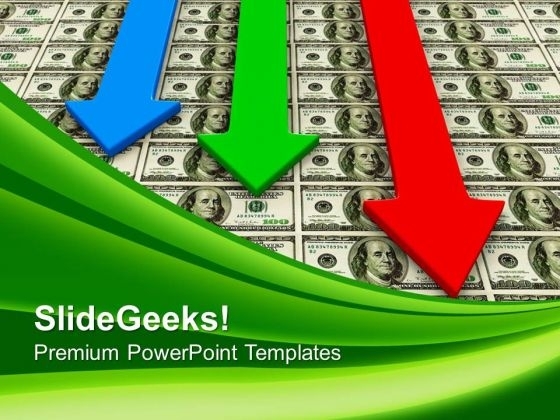 Assist the audience to comprehend with our 3d Arrows Over Dollar Bills Finance PowerPoint Templates And PowerPoint Themes 1012. They will always be in your debt.